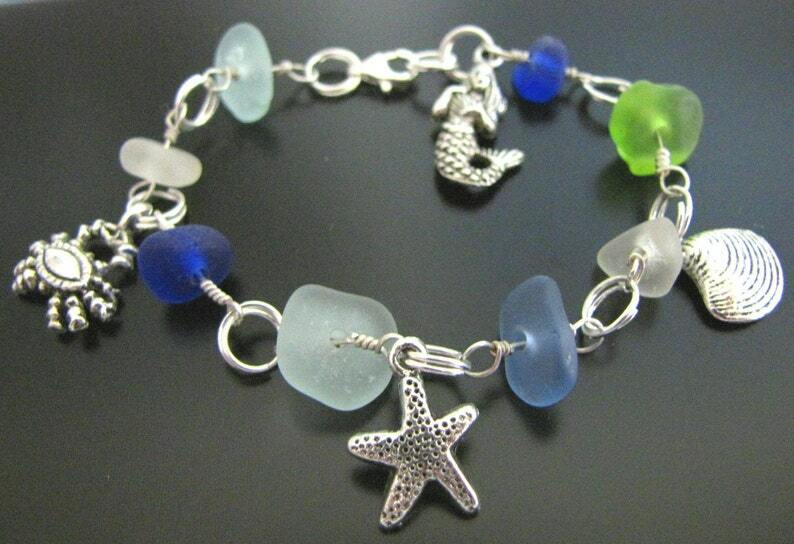 THE SEA GLASS: The 8 rare sea glass pieces in this well made, nautical bracelet were each beachcombed by me from a shore along the majestic Pacific Ocean. The dusty blues may have originated from a vintage, medicine bottle, the aqua from a canning jar pieces and the soft seafoams from old Coca Cola bottle glass. Each piece has been tumbling naturally at sea for decades. They've been nicely assembled into this one of a kind bracelet. GIFT BOXED W\/CARD: Your piece will come in a cotton lined gift box and on a gift card that tells the short story of sea glass and gives the name of the ocean the pieces were beachcombed from. MEASUREMENTS & MATERIALS: The sea glass pieces each measure about 3\/8" wide or wider. They are finely drilled and dance about securely from this 7.75", sterling silver chain with lobster clasp bracelet. One of our finest pieces! CHARMS: All "sea life" charms are polished pewter. You will get just what you see here; A crab, seastar, scallop and mermaid. All jump rings and wire are sterling silver.